Lost writer Damon Lindelof sat down with Entertainment Weekly discussing his part in the production of Ridley Scott’s upcoming sci-fi, Prometheus. He was initially given the first draft of the screenplay and was asked for his input. A good idea really, considering Lindelof’s storytelling in the popular show Lost was compelling. Ridley Scott liked the idea so much that Lindelof was given the reigns to take a different direction with the story. Gone were the monstrous aliens and facehuggers — but Weyland’s company? They still have a strong presence. And as we’ve seen from the viral video of David, androids have a presence as well. Basically, Prometheus and Alien take place in the same movie universe, but deal with different horrors that the protagonists must face. It truly was a good decision. Lindelof is right that using the xenomorphs again wouldn’t have the same sense of fear anymore; especially after the amount of films that came out that used them. It’s a fresh take and leaves a mystery for the audience. 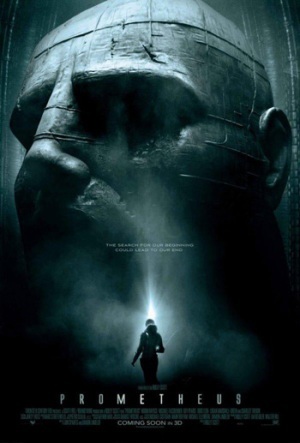 Prometheus comes out in theaters June 8.